Lights, camera, USTREAM! As the term ‘social video’ permeates the technology trending space, consumers and brands alike are looking for innovative ways to benefit from live broadcasting. And when it comes to being in front of a camera, you must always have your best foot forward. So my ‘gif’ to you this holiday season, dear Ustreamers, is a blog stuffed with amusing animations on how to look lovely while live streaming. What does Martha Stewart, Playstation, Salesforce, HBO’s True Blood and radio station Hot97 have in common? Each have become digital influencers in their own right, by utilizing the latest, innovative tool reshaping the advertising landscape: Live Video. In an era when technology and human interaction are intersecting in new ways, adapting multi-dimensional means of engaging your audience is key. Curious on how to optimize the effectiveness of your advertising campaigns to global audiences? Get ready to take notes, people. In this week’s live webinar, SVP of Marketing David Thompson showcased each brand’s boundary pushing strategies on the Ustream platform, and the number shattering stats surrounding their successful live-streamed campaigns. 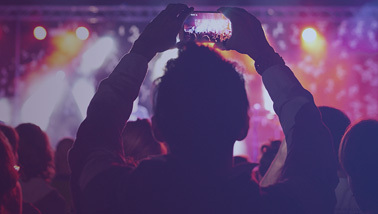 Read more for a recap of our SVP’s informative webinar and educate yourself on the latest trend in digital engagement optimization: the live video experience. What if I told you (in my Morpheus voice, of course) that an entire global audience sits right in your palm, within the convenience of your smartphone or tablet? Yes, my dear Neo, there’s an app for that. With Ustream’s mobile app (for Android and iPhone) you can easily share moments or capture breaking news events in real-time, wherever and whenever they happen. Integrated chat? Check. Audience polling and GPS mapping? Double check. Read below for more details on broadcasting using your mobile device. If you are looking instead, though, for advice on doing a higher quality broadcast using cameras and a mobile Internet source, please watch our Wireless Multi-Camera Live Streaming webinar. I stream, do you stream? 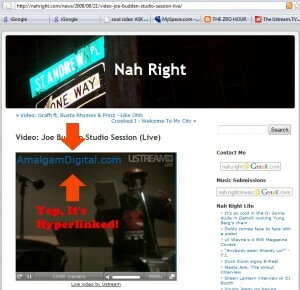 Better yet, do you know how to Ustream? Knowledge IS power, and today is your lucky day to bulk up on some broadcast know-how. Welcome to my weekly How-to blog series, nicely packaged in a Cliff-Note format – for those whose heads immediately begin to throb when the conversation gets too technical. What is the most memorable thing you have seen on Ustream in four years? I remember sitting down at my desk in the morning, turning on my computer, and one of the first channels to catch my eye was a black screen that for some reason had 20,000 simultaneous views. I checked the profile for a location and it was located in Egypt. We were witnessing in live time a whole nation’s cry in the dark for help. The power of Egypt’s chants for freedom resonated loud and clear, and we soon realized we were witnessing a nation’s history being written. That morning we watched the birth of Egypt’s Arab Spring. Summer has officially started, and with that comes the likes of beaches, barbecues, and our topic of the day: wedding season. 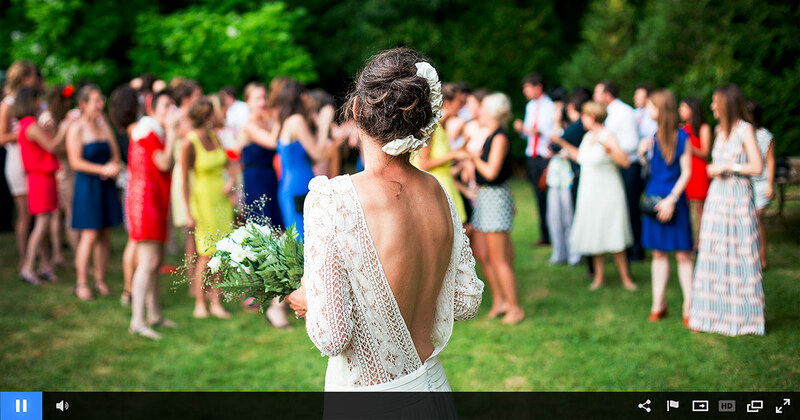 At Ustream, we’ve seen a huge uptick in wedding webcasts, as an increasing number of couples nowadays are weaving technology into their wedding planning. In fact, nearly 20 thousand streaming weddings have been broadcast on the Ustream live platform over the last 12 months. Not only that, but we expect the numbers to keep climbing as well. Check out the infograph below for more numbers. Wedding planners and videographers are well aware of the growing trend, as they realize the opportunity to further expand their offerings. If you are a first time broadcasters, though, and want some generally applicable advice please read our 5 Pro Tips for Live Video Production before your first live stream. Guiding countless artists and musicians through the live broadcast experience, you learn a tip or two regarding the science of a successful broadcast. There are a few elements involved that really contribute to a successful music broadcast: content, interactivity, promotion, and most importantly, distribution (aka embed syndication). Half of my job entails that our featured broadcasters hit on as many of those criteria as possible. Enter Amalgam Digital. The indie online record label with a penchant for innovative online initiatives put together a pitch perfect broadcast event for their newly acquired star talent, rapper Joe Budden. Once upon a time, Joe Budden was a Grammy-nominated, major-label artist with a monster single in heavy rotation. Half a decade later, Joe Budden and the Amalgam Digital team organized a broadcast event that far outperformed most of the bigger name, currently “hot” artists that have passed through the broadband walls of Ustream.TV. 1.) 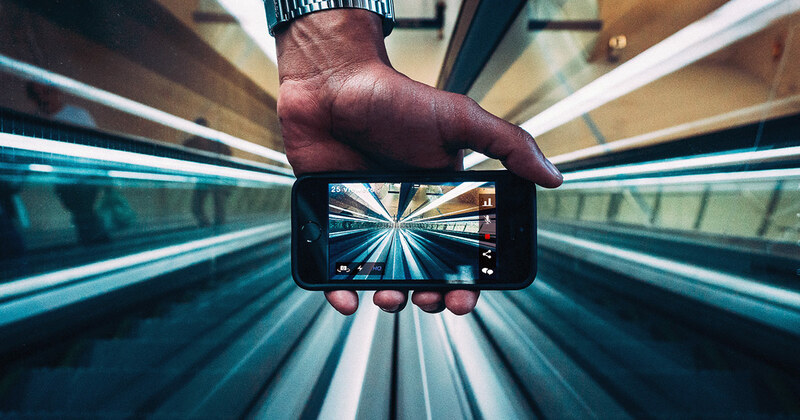 Interactivity: Live video allows for real-time interactions — take advantage of it. Viewers can watch recorded content anytime they want and leave one-off comments, but there’s only one chance to BE a part of the content. Give your fans that in-the-moment excuse to show up on time. 3.) Stamina: Broadcast events are like real-world music events; sometimes folks show up late. Joe Budden planned on going 3+ hours, giving his fans plenty of time to gather around and build viewership momentum. Too often, artists shut off a broadcast after chatting for 30 minutes, leaving their fans hanging at the peak of their interest. 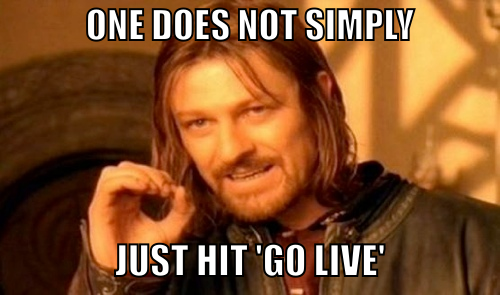 Give your broadcast a breathing chance to go viral… go for the distance! While the Budden event was clearly a one-off, I should also mention that regularly scheduled programming also plays well over live video. And that’s content for ‘ya… let that marinate as you cook up some creative inspiration. … and Purevolume and Facebook and Virb and blogs and websites and label sites. Make blasts, embed onto your profile. Get creative. Ask your fans to take embeds and throw it up wherever they can. Give out an autographed CD to the fan that embeds and blasts on the most amount of websites, blogs and landing pages. 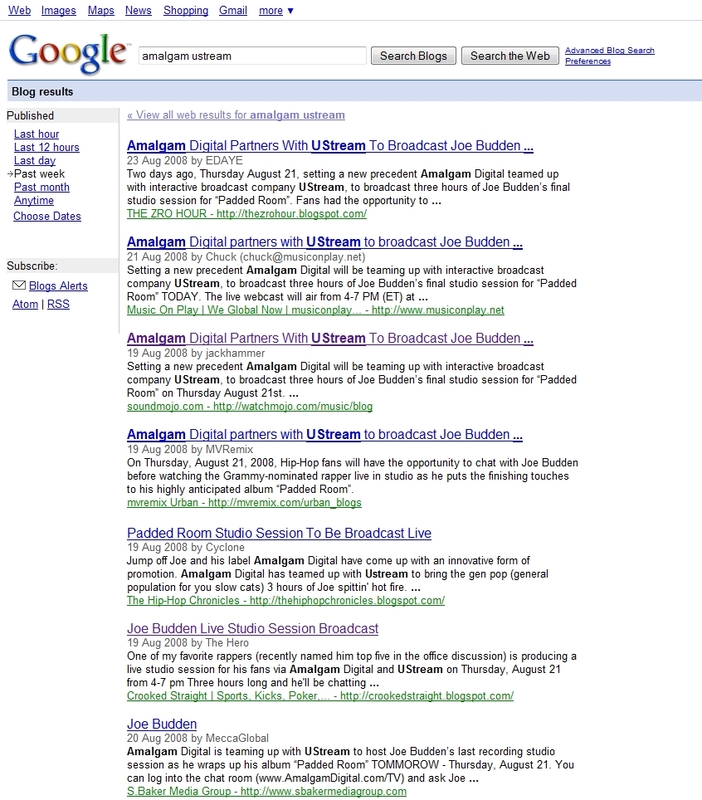 Sometimes broadcasters get protective over their content and their own destination sites. 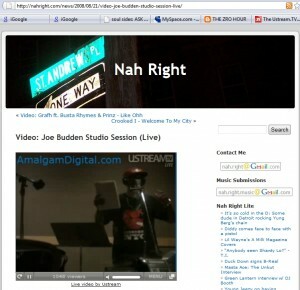 Indeed, 90% of the Budden studiocast was viewed via embeds outside of the Amalgam/Ustream domain. Lesson being, be very open about your content. Don’t have access to uber-bloggers? Start with the sites you have control of. Post and embed on your Myspace and Purevolume accounts, your blogs, your sites, etc. Give your fanclub or street team the embed codes, and let them go wild tagging up the clean white walls of the internets. Send out text message blasts to your friends. Point being, go directly to where the eyeballs are at. Attenion spans are short these days, so fid ways to reduce the amoun of clicks it takes to get to your show, and you’re golden. Digital Amalgam smashed their previous single-day traffic numbers, translating into a spike in pre-order sales for their digital music storefront. With an ounce of creative vision and a dash of inspired execution, Jay and Felix over at Amalgam Digital took advantage of Ustream’s gratis platform to the fullest, garnering the type of Buzz and PR normally reserved for big budget marketing campaign. Do you have the next killer idea for your artist or music event? I’d love to hear it out and help you execute. Shoot your idea and contact on over to music ustream dot TV. Let’s make it happen! 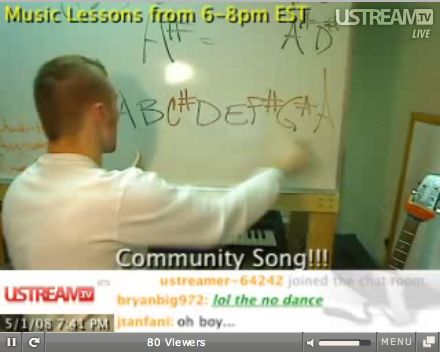 Now we have music lessons. The teacher, singer-guitar-player- extraordinaire, goes by “Walt”. Every weekday Walt goes in front of his camera and gives music lessons to 200-300 people. Using our co-host feature he encourages willing viewers come on and perform their various musical talents – giving them a chance to have some one of one time. His show is well produced, consistent, and he posts on Twitter whenever he goes live – Walt gets it. According to his bio Walt started playing guitar at the age of 16. He has an associates degree in Jazz Performance and a Bachelor’s in Music Composition. 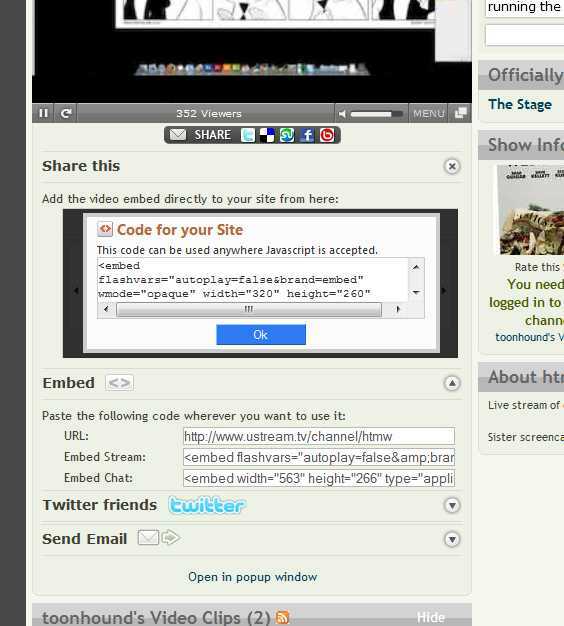 Over 50,000 total Ustream viewers and 750+ YouTube subscribers. Walt’s audience is growing rapidly and shows no signs of slowing down – at this speed he’s going to teach the entire world to sing and then he’ll have nothing left to teach! Walt – Ustream commends you on your expertise in music and your ability to captivate an audience and handle a class of over 200. Keep it up. P.S. – We usually post on Twitter when he goes live, so follow us here and subscribe to our blog here.